Catlin Cargo on Acturis. 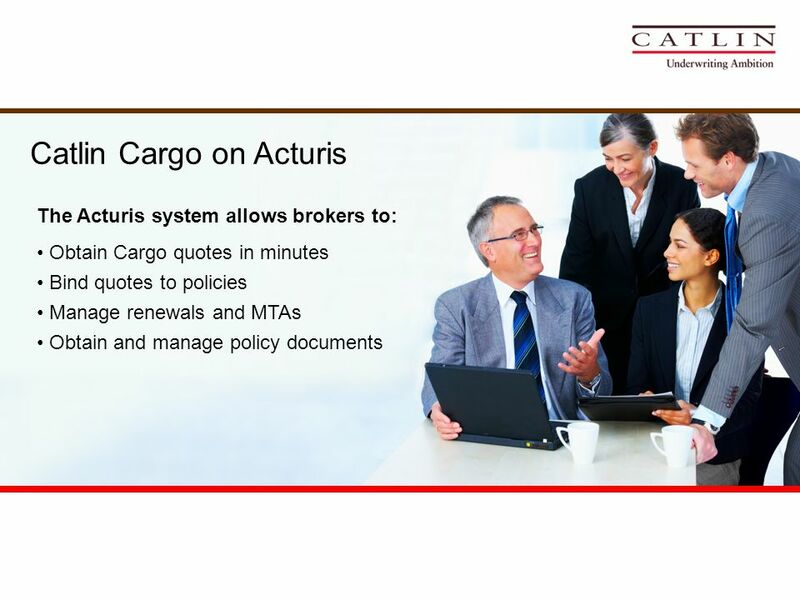 Acturis brokers are pre-approved for a Catlin agency for our Cargo product. 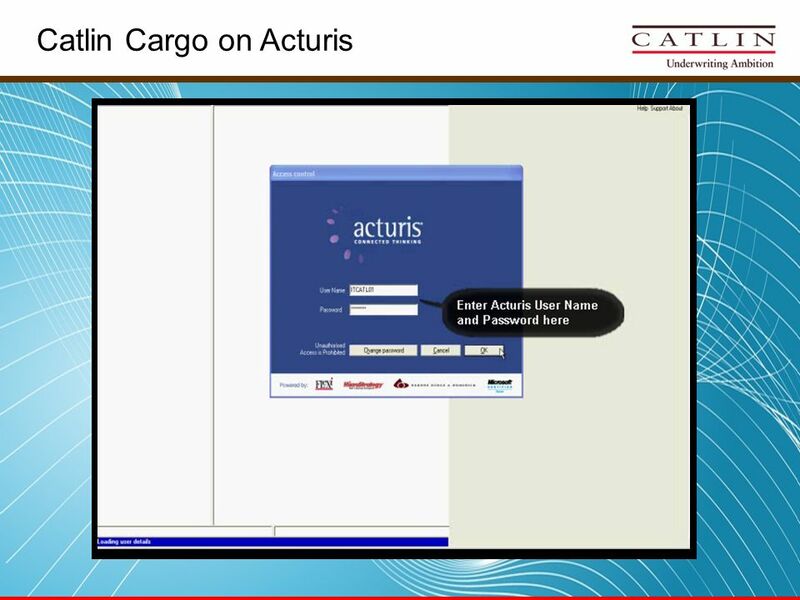 Register to use Catlin Cargo on Acturis with one. 2 Acturis brokers are pre-approved for a Catlin agency for our Cargo product. 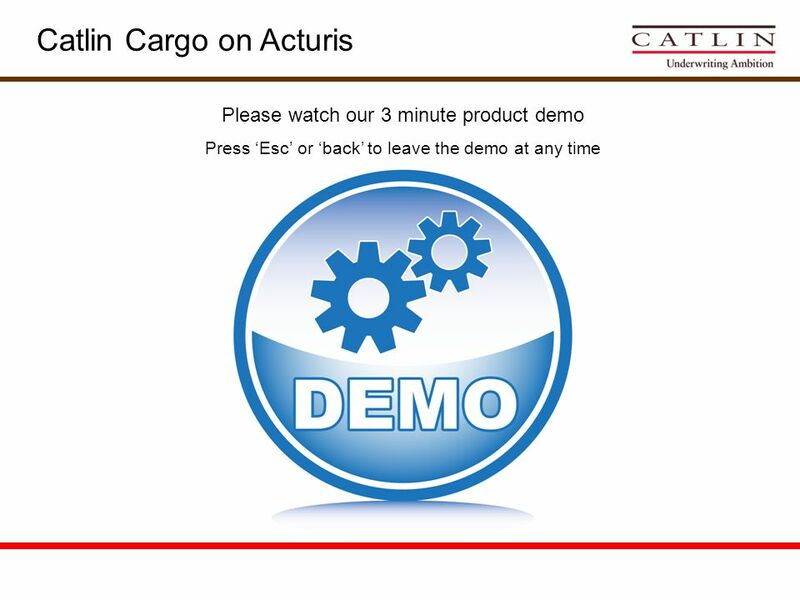 Register to use Catlin Cargo on Acturis with one simple form. 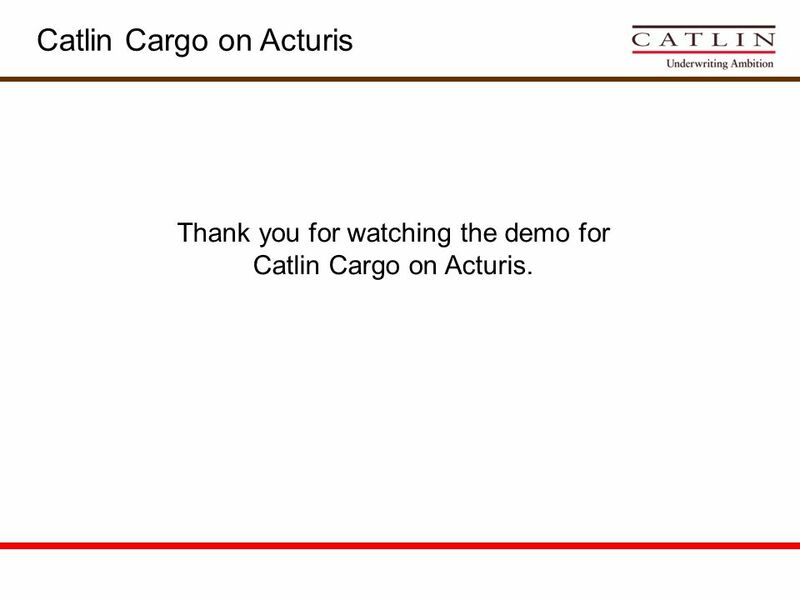 7 Thank you for watching the demo for Catlin Cargo on Acturis. 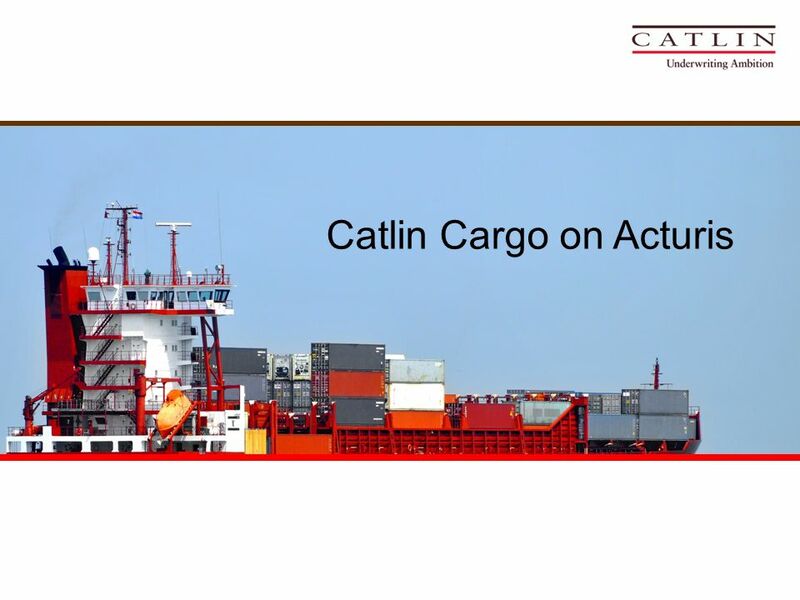 Download ppt "Catlin Cargo on Acturis. Acturis brokers are pre-approved for a Catlin agency for our Cargo product. Register to use Catlin Cargo on Acturis with one." With Market Reform Office Market Reform Forum Whats new this month? Market Reform in the London Company Community Christopher Croft, MRO John Hobbs, Director. With Market Reform Office Market Reform Forum Whats new this month? Lloyds plans, update on message service & claims Andy Brookes, MRO Steve OConnor, Operations. Market Reform Forum Market Aspen ePlacing+ Update. Electronic Placing Market Reform Forum February 2008 Rob Gillies Lloyds Market Association. Sara-Insurance Management System Multi Environment Solutions. Instructions for Quoting & Issuing Recreational Insurance U.S. Insurance Services A part of American Reliable. Master Program Railroad Protective Liability Stephen A. Benigno Insurance and Risk Control Program Manager SEPTA David C. Pitcher, ARM-P Claims and Insurance. NRC and the GenCap What to expect …. From NRC Pre-deployment preparations Monthly salary & allowance payments Reimbursement of lodging & travel claims. Export-Import Bank of the United States Broker Conference 2011 Multibuyer Insurance. Introducing… Crime Pack ®. 2 What is Crime Pack ® ? Crime Pack is our Commercial Crime Policy that is comprised of frequently requested crime extensions. Charter Funding Financial Corporation The benefits of being a part of our team. Cover London Market Group Forum Electronic transaction initiatives at Beazley Ian Fantozzi Beazley Shared Services 24 February 2010. Insurance Personal Insurance. How insurance works PREMIUMS COMPENSATION INVESTMENTS EXPENSES INSURANCE. Relevant Life For financial advisers only. Agenda 1.What is relevant life? 2.Target market 3.Legislation 4.Taxation of premiums and benefits 5.Tax saving. Presentation by: Ken Wolf Executive Overview An introduction to the AffirmX Risk Intel Center platform Reduce risk management workloads, anxieties and. North Shore-LIJ CareConnect Group Enrollment Portal Overview.